The tube leaving Brixton station is hot. It’s the kind of humid heat that makes your hand slide down the tube pole as you try to keep yourself standing. Pressed against hundreds of others, you can feel your tangled, matted hair slicked with sweat, and you can taste that same sweat that has formed in beads on your upper lip. It doesn’t matter, though, because those hundreds of people just experienced a unique spectacle that will never be seen in that form again. A car, on fire, a torch… also on fire and, for the first time, golden-yellow, flame confetti, choking you and setting your lungs on fire as you try to yell along to ‘Trees’. Never have you been surrounded by so much yellow. 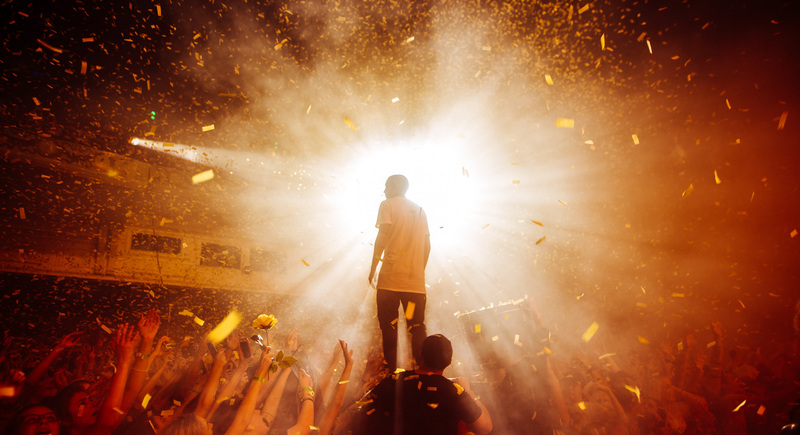 At a Twenty One Pilots show, every fan seems to be the band’s number one fan. Everyone is dressed in camouflage with yellow tape accents, and they’re singing in the queue for hours before the show begins. Just talking with them you can feel the excitement and anticipation radiating off of them. Nobody knows what will happen at A Complete Diversion, and that apprehension is clearly felt in a weird electricity over Brixton. You see, Twenty One Pilots have been on a hiatus for over a year by this point. The band had completely abandoned their social media – disappeared so well that nobody could find a picture of what they looked like anymore. A Complete Diversion is the exclusive catch up that will absolutely “water your lane”, and nobody wants to miss it. Monday, they’ve been camping out since Monday. You count on your fingers 3 days of not ideal weather conditions and wonder what dedication the fans have. This is brought as a harsh reminder as a girl, bright red, drenched in sweat, a manic look in her eyes, begs security to stay in the pit even though her face tells you she WILL pass out before the end of the song. And so she stays, and so she cries, and so she gets crowd-surfed out unconscious. 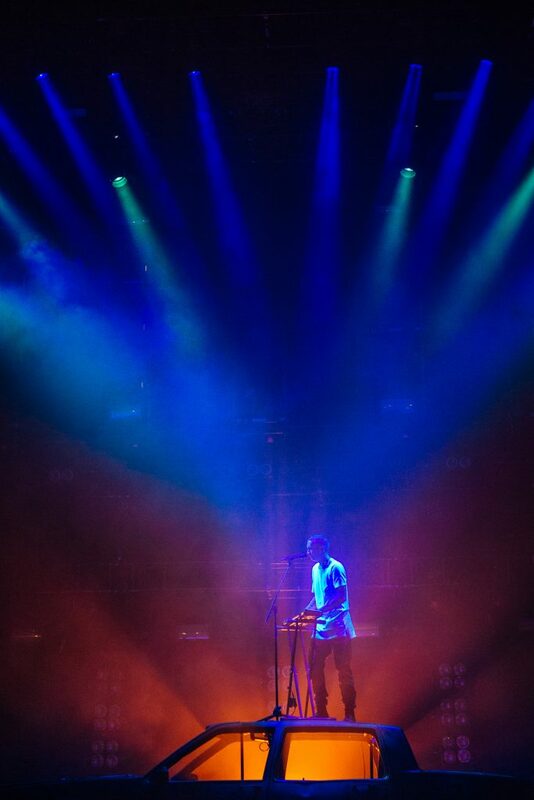 At a Twenty One Pilots concert- you leave when you’re dead. The girl next to me, at her first TØP gig, fails to believe me when I express how violent the pit is. How can the fans of a band with ukulele songs be violent? Impossible. After a tense two hour wait, standing in the pit at the O2 Brixton, the room gets brighter and brighter… and then plunges into darkness. Twenty One Pilots burst back onto the scene with an array of bright lights, costume changes and, apparently, a car on fire. The voices of the crowd singing along seem to fill up the room and almost drown out Tyler himself. You can see it on the band’s faces, they are more than ecstatic to be back and playing and they are shocked at how the fan base has grown over their 400 day hiatus. The bands set seems familiar, shadowing the old setlist, but with the new songs interspersed between. The familiarity is carried through into the new songs too, as it seemed everyone in the venue knew every lyric and screamed them out as if they had been doing so for years. And so the set continued through, stopping off at songs such as ‘Holding Onto You’, ‘Ride’ and ‘Stressed Out’ and moving from bass to ukulele to piano. During the undeniably funky song ‘My Blood’ Tyler splits the crowd down the middle, asking everyone to sing one of two parts of the chorus, and together they sang; harmonious and excited to be the first room of people to sing My Blood. Then, during Trees, when Tyler and Josh stand on tiny islands on the crowd, you can normally expect red and white confetti. For years the band has projected thousands of tiny pieces of red and white confetti, yet on that night, the confetti was yellow. Everyone in the crowd has their faces up to the sky as bright yellow confetti rained down onto them. It was beyond a special moment. It’s official, Twenty One Pilots is back, and they’re better than ever. Twenty One Pilots’ Bandito tour will make its way to the UK in February 2019, including three shows at London’s SSE Arena Wembley. 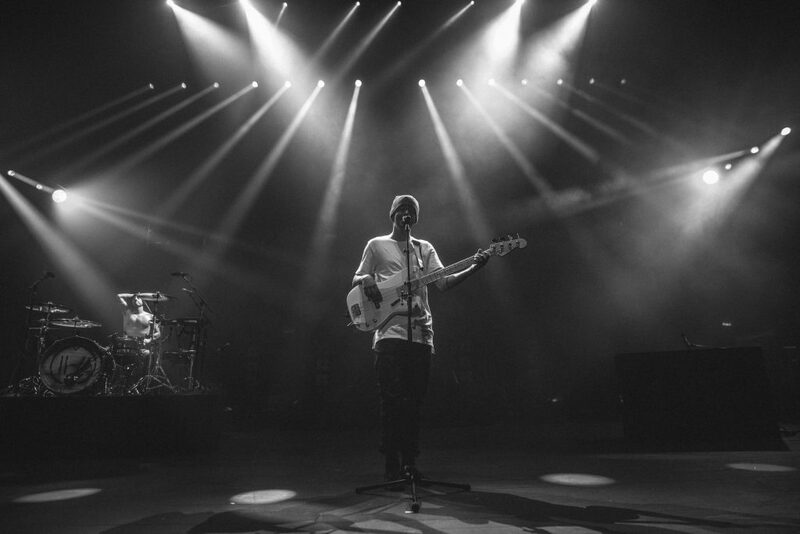 For more info, tickets and everything else visit the Twenty One Pilots website.